Michel de Nostredame, later to be known as the famous psychic 'Nostradamus' was born on December 14th, 1503 in St. Remy de Provence, France. His education in part was influenced by his families descent, which was Jewish, though he and his family converted to Catholicism when he was a young boy. He studied Jewish occult literature as well as astrology, which led to his introduction to Latin, Greek and Hebrew. In his later years, he was sent to Avignon, France, to study medicine. His education in medicine gained him a bachelor degree and it was soon after that he started the path of healing and was even instrumental in developing methods of treatment, which helped those suffering from the Black Plague. At age 26 he returned to Mont Pellier to further his studies towards a Doctor's degree. His attitude and skills won him acclaim at his college and an instructor took him under his wing and furthered his medicinal studies for an additional year. While his path into the medical career seems assured, he soon left Mont Pellier and met a woman that he fell deeply in love with. It is rumored that he re-kindled his interest in the mystical realm of knowledge at this time. He married his new love and they had two children. It seemed life had settled into a happy time for Nostradamus, but sadly that would not remain so. 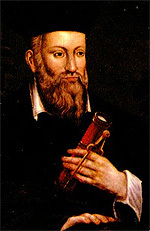 Both his wife and his children died of disease, leaving Nostradamus on his own to struggle with loneliness and a difficult and accusatory church. As France sank into the clutches of the Spanish Inquisition, Nostradamus wished to free himself of this repressive belief system and made his way to Italy. Here he continued in his astrological and alchemy teachings and also helped with the ever spreading plague. He was valued and sought after for his medicinal contributions and spiritual wisdom. After Italy, he later moved to Salon de Croux and married for a second time. Here he started a new life and embarked on a book called, "Traite des Fardmens". The preparation of this book required that he delve deeper into studies with apothecaries and healers as its contents included the world's first medical directory. By 1555 Nostradamus had finished the first phase of another book that would contain over 300 predictions, one of which was the death of Henry II, husband to French Queen, Catherine de' Medici. She heard of his work and summoned him to her court to review his predictions. They met and became friends and he subsequently became the royal personal physician and advisor to Henry II. As Nostradamus' predictions gradually became true, people were either upset or astounded, but no matter what side of the fence people landed on, his fame continued to grow. People of great nobility and consequence came to visit him, eager to see into their own lives, or those close-at-hand. Around 1565-66, Nostradamus' health began to deteriorate and it would be soon after that he would be found dead, later to be buried in the walls of the Church of the Cordeliers, in Salon. His real notoriety, and probably that which cemented him into psychic history as we know it, came after his death. His son Caesar gathered what unpublished prophesies he could find and had them published in 1568, two years after his father's death. His prophecies have always been known to be confusing and this remains a conundrum to this day. He intentionally confused the chronological order of his quatrains as a way to confuse the interpreter about the future. Quite possibly, only he truly held the key to his work. He implied though that while his quatrains where a bit veiled, they would be fathomable to a man of 'high intelligence'. He prophesied about many things and many places but it was mostly centered on the region he was most familiar with (Europe, France, etc.) though not entirely. He did supposedly provide prophesies about air and space travel, Presidential assassinations, the Iraq war, and the 9/11 tragedy. As you can see, his prophecies were also of a rather dark nature. It was usually something about the most difficult aspects of life such as disease, war, famine and premature death. There are few scholars who will unite and agree on any one meaning provided by Nostradamus. Ị think as much as we can, it's up to us to do our own research, read the various opinions and quatrains and come to our own conclusions. It's hard to determine how much is true and how much we're looking to be true. As in many things pertaining to psychics, there will always be critics and always be fans. You decide!